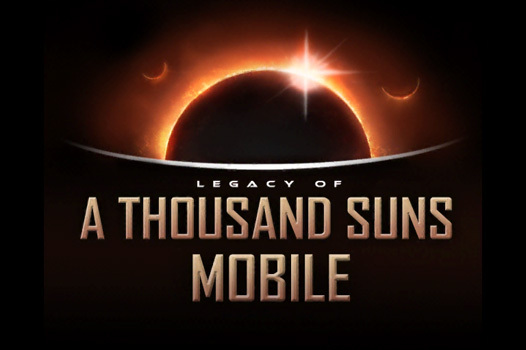 At first glance Legacy of a 1000 Suns would seem like another hammy mobile game with an oriental hook. However, the game instantaneously disproves that judgement and gives you a sci-fi mobile game that may become your next time sink. LoTS plays like your typical simulation FB/mobile game. You control one unit as said unit travels through LoTS’ universe through either its unfolding story at missions and or raiding against bosses with your fellow LoTS players. Missions in LoTS puts you in the shoes of “The Captain”, the protagonist of the game’s narrative. 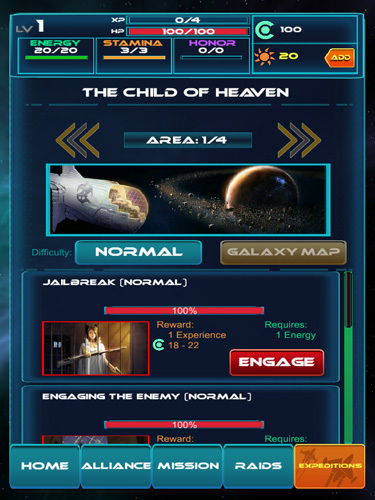 You are given his/her POV as you engage through each mission at the cost of at least 10 stamina points each attempt. As you go through each mission in LoTS you are welcomed by a highly stylized narrative that would put other mobile games to shame. In fact, I am already going to warn you that I’d be giving the game’s story writer (and the story itself) high praise till maybe the end of the article. 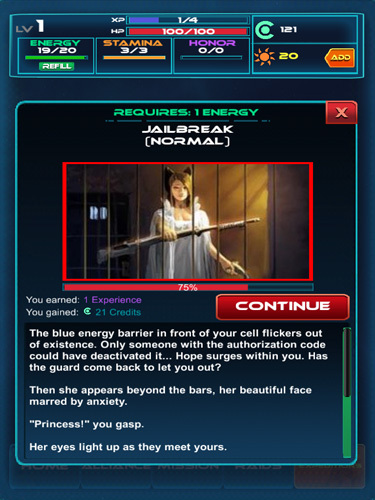 One of LoTS’ quirks is that you can’t just redo each engagement like in other mobile games. You have to restart the whole “act” before you can revisit the mission you just finished in hopes of “maybe” having a more cohesive storytelling experience. Aside from doing missions, LoTS has a raid system in place where you can keep on facing bosses that you can’t take down alone. This may be the game’ biggest replayability factor since you’d be required to keep on coming back till someone would eventually be able to defeat said raid boss. 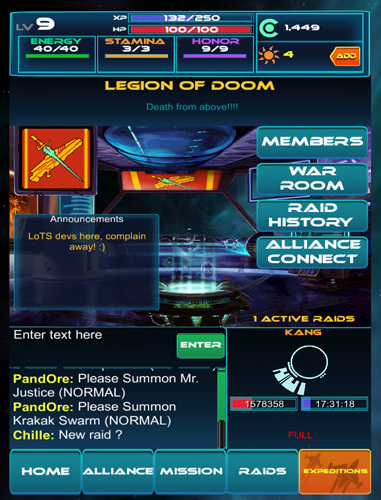 Legacy of a 1000 Suns also has a raid code system in place where you can share it through your social networks to get more people to help you take down the raid boss. You can see it on screen and can go to either your FB wall or the game’s FB wall and share it for the world to see. All they need to do is just input the code in-game and they’d immediately be able to help you out in your raid. 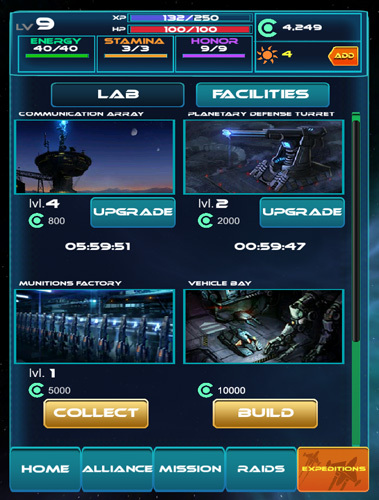 Aside from the gung-ho battles on missions and raids, LoTS has a mini-simulation feature where you can “build” structures in your labs to supply you with credits and items as you play through the game. While it’s not as in-depth as most mobile games go in this area, it keeps the gameplay varied so the game won’t bore you too much. 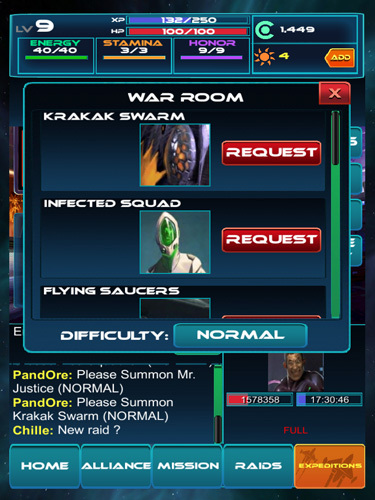 Since LoTS has raids, it’s pretty logical to expect that the game allows banding of players to finish raids. In this regard LoTS has the alliance system in place. They serve as the game’s guild system where you can tell your alliance mates to help you or open up raids for you to take part in. The alliance also has a chat room where you can talk to members in real time for coordination and basic communication. With the game’s title alone, LoTS gives off a novel-like vibe that does deliver quite nicely. I have never seen a mobile game that’s so well written and stylized that it makes you feel like you’re reading a sci-fi space drama instead of playing one. This specific strength of LoTS however is a polarizing one since the possible target players of the game would either choose to love the prose or hate it. Also, given that the game’s medium is the mobile platform, it should be expected that players would want short, quick bursts of gameplay that the game fails to deliver. In fact, I’d like to point out that one of the game’s biggest problems is the pace of the player’s progression. Normally, with a game like LoTS, players would expect to accomplish a lot of things for the first few hours of gaming. That however is lost in LoTS since engaging missions would require a minimum of 10 points at least, and it would take almost 5 minutes to regain a stamina point. 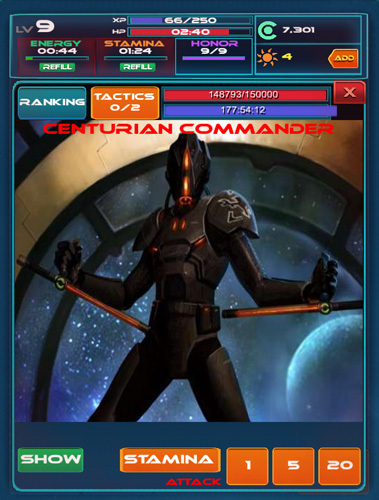 It would seem that 5th Planet Games would still need to fix the balance in the stamina regen time and stamina point used per engagement since the website boasts of “fast leveling” in LoTS (found in their site http://www.5thplanetgames.com/projects). The other issue I’d like to raise is the alliance system in-game. With the raid system game mechanic you are at the mercy of other players in terms of their activeness in playing. In fact, I am still not a member of the 30+ member alliance I applied for almost a week ago. The game doesn’t allow you to go apply for more than one alliance, and that’s just bad for a game that emphasizes the importance of such connections. The game also has a thing for pushing the premium currency (suns) in every nook and cranny. 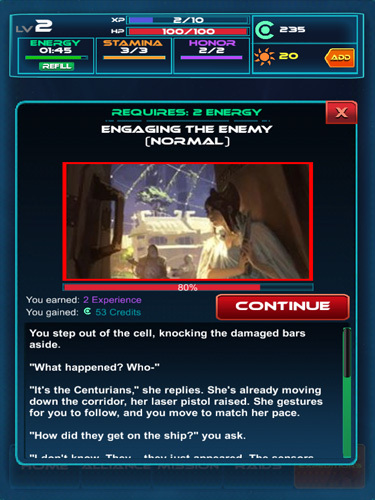 While engagements do reward you with suns, it won’t be enough to cover most of the things you need to do in-game. But of course it should be given into consideration that the game needs some revenue for it to continue operations. It would’ve been better though that it wasn’t as obvious. So in the end I can say that Legacy of a 1000 Suns is not a game for everyone. 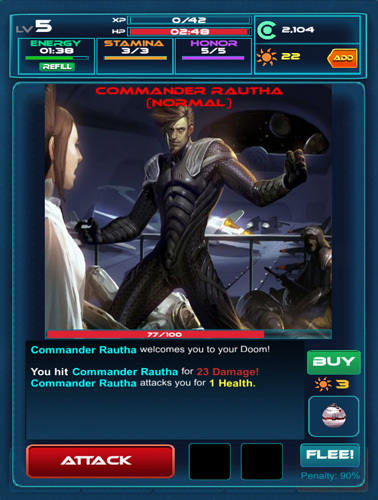 Unless 5th Planet Games changes the stamina points cost OR the stamina recovery time, the game would find it hard to get fans from the casual gaming market. Since that specific gaming target would want to play fast and do a lot of things in as little time as it would take. However, if you’re the type of gamer who’s looking for a good narrative that mobile games (or games in general) seems to lack these days, but have the patience that would shame even Gandhi, then by all means LoTS just might be the game for you!